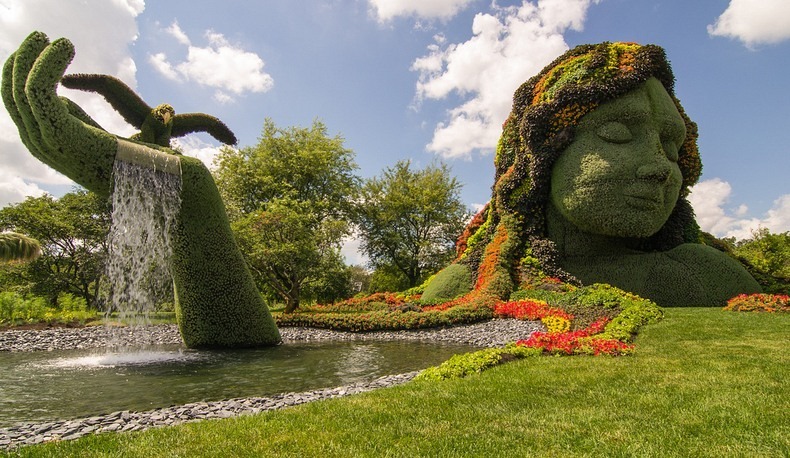 Considered the world’s most prestigious competition of horticultural art, the 2013 edition of Mosaiculture is currently on display at Montreal Botanical Garden in Quebec, Canada. More than three million flowers were raised in greenhouses throughout Quebec, and then shipped to the gardens in May, where designers wrapped them in steel meshes to create living works of art. The sculptures are created using steel or aluminum forms that are wrapped in metal mesh, filled with earth and planted with flowers, ivies and grasses whose foliage provides texture and color. Interior watering systems and growing medium were added so that the flowers could last all through the summer till the end of the exhibition on September 29.